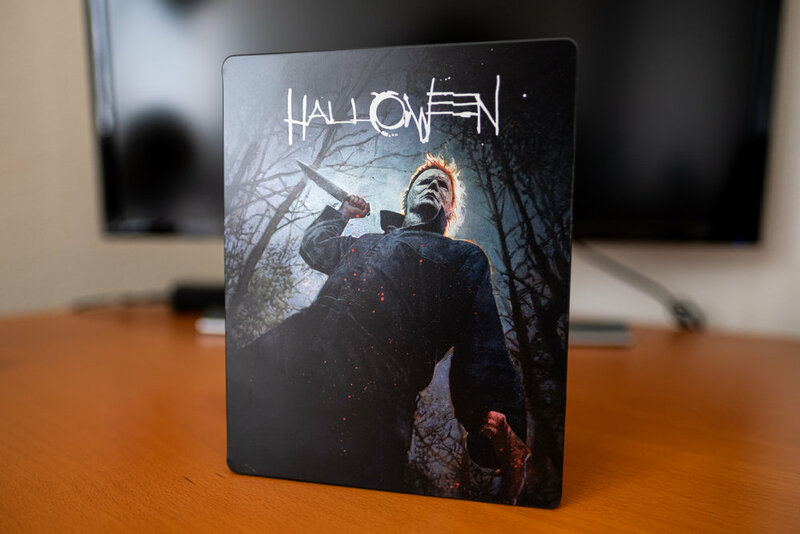 The shape is back, and so is the slowly growing 4K UHD horror collection. Best Buy released their exclusive Steelbook last week, which has been a quick seller locally. No stores within 250 miles currently have this in stock. It’s a little surprising since the pre-order was always available since the film hit theaters in October. Bill Sienkiewicz graces the front with beautiful artwork; a physical art print was released by Mondo around the theatrical release as well. I think it looks great on the Steelbook. On the back cover is a pumpkin carving, while the interior features Laurie holding a gun. None of the art is consistent. There’s an actual piece of art on front, random-ish pumpkin art on the back, and an actual frame or promo still of Jamie Lee Curtis from the film. 4K UHD disc features artwork and the Blu-ray only has the movie title. Both discs have bonus features in their respective resolution. The digital copy can redeemed UHD through Movies Anywhere. This is a solid content release by Universal, and definitely worth the $29.99/$32.99 price with it being in exclusive packaging. Rain didn’t stop the big crowd from showing up at SacAnime over the weekend! It was a busy flow of traffic each day for the winter event, and rightfully so with voice actors from My Hero Academia, Overwatch, and Voltron: Legendary Defenders leading the special guest list. Essentials for SacAnime Winter, for me, has always been outfits with several layers to stay warm. That chilly Sacramento weather with windy rain on Saturday/Sunday was somewhat of a nuisance when not inside the convention center. However, the fun vibe inside throughout the weekend kept things going as usual. SacAnime may have “anime” in their event name, but fans of all pop culture mediums are bound to find stuff of interest. It still is a very anime centric event even with it’s stretching appeal to comics, tv, film, and western toys. The event features many local favorites for vendors and food/drink options in the vendor room. One of the standout vendors this year was Wild Bill’s root beer (they’ve become a staple at Sacramento pop culture cons lately); it felt like every other person was slinging a tin cup getting unlimited root beer refills. Traffic in the vendor room was consistently busy. Weather was definitely a contributing factor, so it made sense to see an increase in people shopping around for longer periods of time. Panels and other programming filled up the daily schedules for attendees looking for other activities outside the vendor room. Cosplay gatherings after Friday were mostly moved to indoor locations (cosplay lounge, stairwells) to avoid the rain. The weather worsened venue access on Sunday with the east lobby terrace closing. Should I mention the fire alarm that evacuated the convention on Saturday afternoon? The emptying of venue ultimately kept the vendor room opened an additional 30 minutes to make up for the fire alarm delay. A fun highlight for me was meeting Josh Keaton (Hercules, Voltron: Legendary Defender). My friend Phil asked if I wanted to join in his photo, so I figured why not. I usually only meet special guests at events if I have to do interviews, but this guy has done voices for many memorable characters in tv/film. 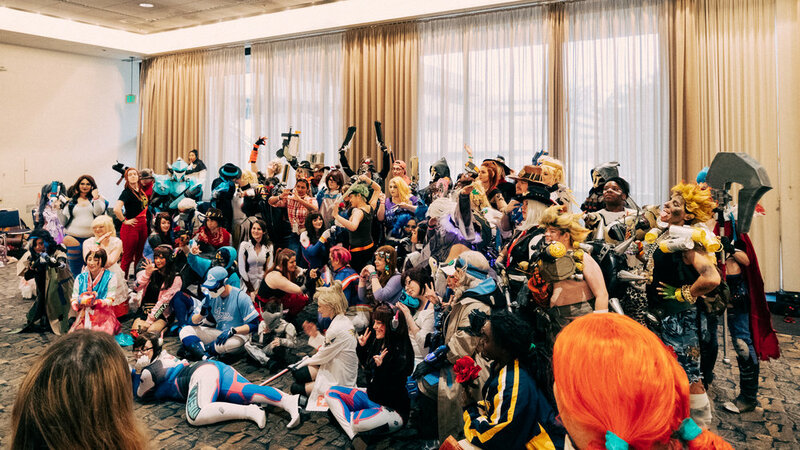 I went to the Overwatch cosplay gathering since it has always lured a big turnout since 2016. This gathering was held in the cosplay lounge room. Lighting was rather harsh to capture pictures there, but I made it work for the group shots. Cosplay lounge is located on the second floor of the convention center, which isn’t exactly the most ideal spot for foot traffic, but the area is very much dedicated for people in cosplay to sit and relax. Check out the complete photo gallery for the weekend in the slideshow format below. Pictures can still be viewed with it’s proper gallery link if you prefer viewing without the article stuff included. There was a healthy amount of My Hero Academia cosplays out and about. Overwatch, obviously, continues their consistent presence, while Spider-Man related suits came out in force on the legs of Spider-Man (PS4) and the super successful Spider-Man: Into the Spider-Verse film. This event remains very balanced on what you see in cosplay. Some trends fade after a year or so, but a few stick around forever with strong fandoms. I brought my lightweight Canon camera gear for the weekend — M50 & M100 for bodies, 11-22mm & 32mm for lenses. It got the job done, but I really wish I brought the newly (re)acquired Fujifilm stuff. The main reason why I went Canon for SacAnime was mostly due to needing a bigger camera bag, which will be a problem fixed this month! SacAnime Summer will be returning later this year in June instead of it’s usually late August / early September date. The convention center will be doing renovations for over a year, which means all of SacAnime in 2020 will be held at Cal Expo. Be sure to enjoy the last summer event on June 7-9, 2019. Early Bird VIP registration / hotel info is already available, so jump on that sweet offer if you already plan on attending. Funko has been releasing Pops within their Ad Icons series quite often in the past year. Honey Nut Cheerios / Buzz was one of the last Funko-Shop releases of 2018, and it sold out rather fast in typical Ad Icons fashion. The sculpt of Buzz is very identical to the actual design seen on cereal boxes aside from the blacked out eyes. Detail on the wings and honey stick sweeten up the figure design even more. The dripping honey stick makes me crave honey like no other to be completely honest.